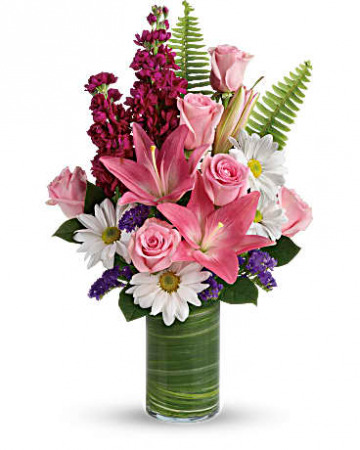 Roses, Lilies, daisies, oh my! Simple and sweet, not at all fussy. Perfect for smaller spaces. 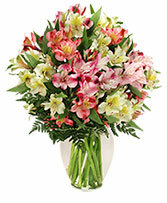 When the Day is extra special and you need to celebrate with style, this is the perfect bouquet to send. 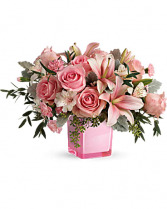 Beautiful pinks with roses and lilies send a strong message, " you are special today and always". This is a girly girl pink delight. 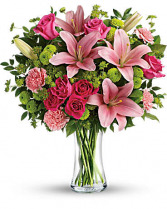 Lilies and roses, a carnaton or two. Whats not to like! WE HAVE CUT OFF WEB ORDERING FOR FEB 14TH. ALL DELIVERY SLOTS ARE FULL, WITH THE EXCEPTION OF SAWYER FULLER FUNERAL HOME.